Martha McSally Wants to Go to Washington to Do… Nothing? 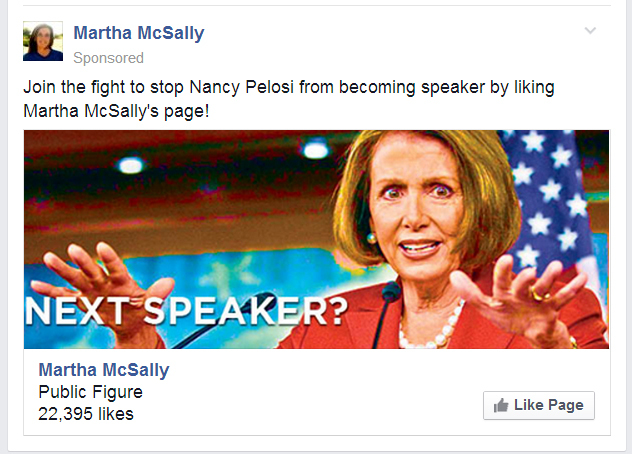 “Warrior woman”, anti-feminist, and perpetual political candidate Martha McSally wants me to “like” her Facebook page. The only reason someone like me might considering “liking” McSally’s page is to keep tabs on what the stealth candidate with no opinions and no ideas is doing. But I find McSally’s ad featuring an intense, wild-eyed photo of Nancy Pelosi offensive. The obvious conclusion is that McSally wants to unseat CD2 Congressman Ron Barber and join Boehner in the House because it’s a powerful job that pays well, it’s got gonga health benefits, and you only work a handful of days per year. McSally has been on the government teet for years– in the military, as a Congressional aide, and at Raytheon. She is the poster child for the military industrial complex. Aspiring to be part of Boehner’s Do-Nothing Congress is right up her alley. She will be in good company – her fellow Republicans have made it a tenet of faith to do nothing! Or to do harm, like cutting food stamps and refusing to renew unemployment insurance for long-term unemployed!